Bill's Movie News and Reviews: Ridley Scott creates an alien world in his retelling of the Biblical "Exodus: Gods and Kings"
Ridley Scott creates an alien world in his retelling of the Biblical "Exodus: Gods and Kings"
My overall reaction to Ridley Scott’s retelling of the Exodus story “Exodus: God and Kings” is that it helps explain “tribalism” and the tendency for people to have to do things in groups, in solidarity, especially religious or ethnic solidarity. It also helps show the susceptibility of people to radicalization, at least revolution. That’s the way of the most of history, and I escaped most of it for most of my adult life. The film obviously gives Scott a chance to show off the latest CGI in 3-D, and the movie conveys the look of an alien civilization on another planet. The vision, however cluttered with ancient urban shanty, is impressive and detailed. I saw “The Ten Commandments” with my family in 1954 at the old RKO Keiths in downtown Washington, and so it’s pretty hard to top that. Scott-Free's new film short circuits the whole Golden Calif episode. Arnold Schoenberg tells the story in his opera "Moses and Aaron". When the pestilences come, about 90 minutes into the 150 minute film, the play out in quick, hushed succession. They indeed take the movie into horror, however directed at “the enemy”. There is even some impressive CGI work creating multiple tornadoes in the Red Sea scene. Christian Bale is charismatic enough as Moses, but in the movie’s length, his loyalty change back to his own people is really not told clearly enough. Scott’s idea of using a child as an angel representing God or Jehovah is interesting; another adult would compete too much for Bale. Some of the rest of the cast, such as Joel Edgerton as Ramses, Ben Mendelsohn as the viceroy, Andrew Tarbet as Aaron, and Sigourney Weaver as Tuya, are just OK. Some critics have noticed that most of the cast, even playing the Egyptians, are white. This movie is of the “spectacle” genre. The best film of all time of this nature was the first Cinemascope picture from Fox in 1953, “The Robe”, based on the novel by Lloyd C. Douglas. I remember crying at the end, at the age of 8. I saw this in the old Jefferson Theater on Route 50 near Falls Church, VA, the first “neighborhood” theater to be remodeled for Cinemascope. The official site (from 20th Century Fox) is here. The Fox trailer starts “when men ruled as gods”. But they had clay feet. The film was shot largely in Spain and the Canary Islands (only a little in Egypt). The latter is ironic, since the Canaries have a volcano, Cumbre Vieja, which could cause a 100-foot or more tsunami all the way across the Atlantic (with an 8 hour warning) if it erupted and caused an underwater landslide (link). I saw this film before a light Sunday night audience in a large auditorium at Regal Ballston. I did see Otto Preminger’s "Exodus" (based on Leon Uris) in high school (in 1960). 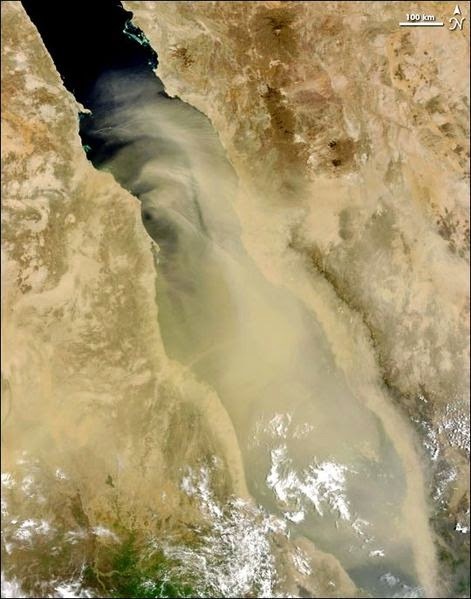 Wikipedia attribution link for Red Sea photo.